Hitler Youth: Growing Up in Hitler’s Shadow is the riveting and often chilling tale of a generation of young people who devoted their energy and passion to the Hitler Youth organization and left an indelible mark on world history. 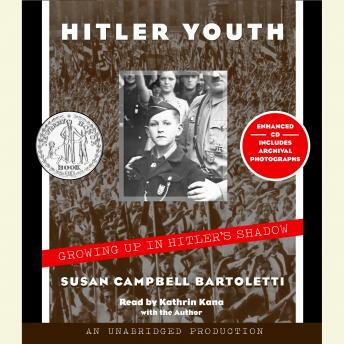 Award-winning author Susan Campbell Bartoletti infuses the work with the voices of both former Hitler Youth members and young people who resisted the powerful Nazi movement. These voices stand alongside those of Jewish youths and others who were senselessly and brutally targeted by the Third Reich. What emerges is the story of average children and teenagers faced with extraordinary and unenviable choices. The paths taken by the Hitler Youth and their struggle to come to terms with their actions at the end of World War II are sure to spark debate among young readers faced with the question of whether the horrors of Hitler’s Germany could ever cast dark shadows again. A captivating book, a cautionary tale to be considered if we want to avoid repeating the mistakes of the past. Well written, and well read.